Save Time! Online Patient Registration. You may preregister with our office by filling out our secure online Patient Registration Form. After you have completed the form, please make sure to press the Complete and Send button at the bottom to automatically send us your information. The security and privacy of your personal data is one of our primary concerns and we have taken every precaution to protect it. While you may think that some loss of teeth is inevitable with aging, it is actually possible for all of your teeth to last a lifetime. One of the ways you can achieve this goal is to avoid periodontal disease (“peri” – around; “odont” – tooth), which is caused by bacteria that attack the tissues around the teeth. Unfortunately, you may not even realize you have gum disease as the signs and symptoms are not always as apparent to you as they are to a dental professional. Nearly all people who do not maintain good daily oral hygiene will develop gingivitis. If left untreated, this bacterial gum infection can progress from gingivitis (“gingival” – gum; “itis” – inflammation) to periodontitis, which results in bone loss around your teeth. As the bone tissue is lost, the gum tissues detach from the teeth and form little pockets that provide an even better place for bacteria to live — where your brush and floss can't reach. As periodontal disease advances leading to more bone loss, tooth loss can result. Part of this has to do with genetics, as periodontal disease tends to run in families. The good news is that periodontal disease can be controlled, even at more advanced stages. Bleeding gums — Some people think that when their gums bleed, it simply means they're brushing too hard. While brushing too hard is bad for the gums, it should not cause bleeding. Any bleeding of the gums should be considered a warning sign of gum disease. Bad breath — It's very easy for plaque to collect in the spaces between the teeth, creating the perfect living conditions for bacteria that produce odorous, sulfur-containing compounds, resulting in bad breath. Redness or swelling of the gums — Inflammation of the gums is usually the first visible sign of periodontal disease. Receding gums — If you notice that your teeth look longer than they used to, it may be that your gum tissue has receded (away from the enamel), exposing some of your tooth roots. Sensitivity — If there is gum recession, the exposed roots may become sensitive to hot or cold. Periodontal abscess — Bacteria can become enclosed in a periodontal pocket and the area will fill with pus, becoming swollen and painful. 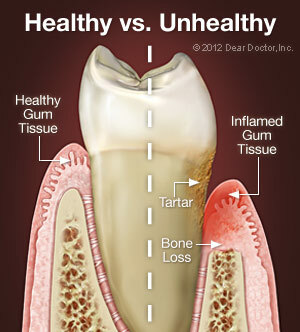 Loose teeth — When periodontal disease results in bone loss, teeth can become loose or migrate. Tooth loss can result and may be accelerated if you are applying excessive biting forces from clenching or grinding your teeth. All periodontal therapy starts with the evaluation of your oral hygiene techniques and instruction for improving them, followed by the mechanical removal of plaque and any calcified deposits (tartar or calculus) that are present on the root surfaces. This is accomplished with a cleaning technique known as scaling, root planing or debridement using hand instruments and/or ultrasonic (high frequency vibrational) instruments. Locally applied antimicrobial products or antibiotics might also be recommended during various parts of periodontal treatment to assist in healing and pocket-depth reduction, hopefully eliminating the need for periodontal surgery. Sometimes surgical procedures may be necessary to remove the deep pockets that form between inflamed gum tissue and teeth. There are many different types of surgery to handle a variety of problems. And many times, combinations of procedures are used to attempt to reduce the number of surgeries as well as the cost of treatment. 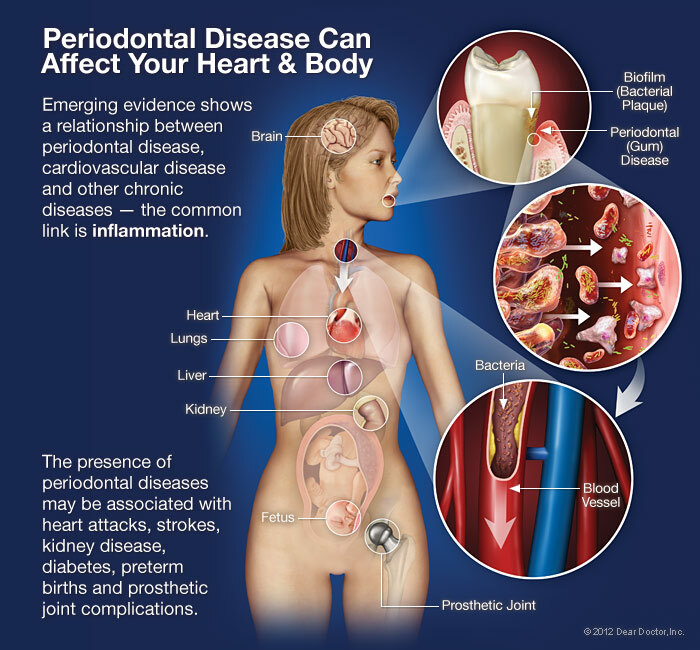 Periodontal disease starts in your mouth but has actually been linked to more serious conditions, such as cardio-vascular disease (CVD), diabetes and preterm births. Research has suggested two plausible mechanisms for how gum disease and these other serious medical concerns could be related: moderate to severe periodontal disease increases the level of systemic (bodily) inflammation — a characteristic of all chronic inflammatory diseases. Also, the same bacterial strains that are commonly found in periodontal pockets surrounding diseased teeth have been found in blood vessel plaques of individuals with CVD. 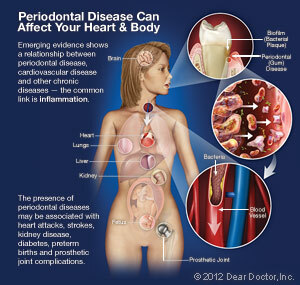 Therefore, it may be helpful to reduce periodontal inflammation to reduce systemic inflammation. The best way to prevent periodontal disease is to brush and floss your teeth effectively every day. Regular dental checkups and professional cleanings every 3 or 4 or 6 months are also an important part of maintaining periodontal health; the instruments and techniques used in these cleanings can reach into areas that your toothbrush and floss can't. It is also possible to detect early forms of gum disease by evaluating your gingival (gum) tissues, both visually and by examining their attachment levels to the teeth. And the health of your tooth-supporting bone can be assessed by taking dental radiographs (x-rays pictures). There are other steps you can take: Eating right, reducing stress in your life, and giving up unhealthy habits like smoking will also help ensure that you keep your teeth for a lifetime.